Heart2Heart – this specialty Toastmasters club explores communication of all kinds. I agree Patricia! Mary is a great story teller and writing mentor and I’m excited to hear her speak at our club. 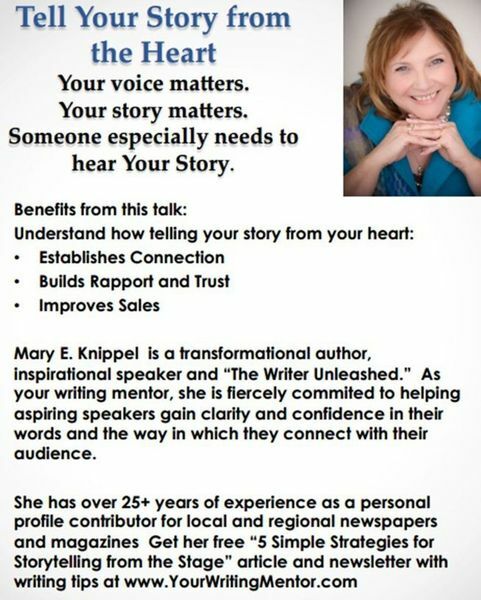 Mary Knippel is an amazing story teller and writing mentor. I’ve enjoyed working with her professionally. Sounds like an amazing speaker! Looking forward to seeing everyone! 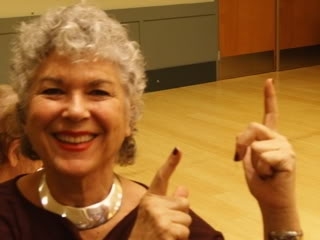 Cheers to Mary E. Knippel http://yourwritingmentor.com and Everyone at Heart2Heart Toastmasters club ! See you there! Bring business cards to network, books to display and sell. Women’s National Book Association members will benefit from learning about new “reading technologies” and how to help libraries, readers and ourselves (authors, publishers, book designers, packagers, book sellers, distributors, coaches, teachers, librarians, et al). The Rockridge Branch of the Oakland Public Library is located at 5366 College Avenue in Oakland, CA. This event celebrates April, National Poetry Month. Featuring Poets: Judith Cody, John Curl, Drew Dellinger, Sharon Doubiago, Joan Gelfand, Genny Lim, Kirk Lumpkin, Mary Mackey, Claire Ortalda, Jeanne Powell, Floyd Salas. For more information, contact Kim McMillon at (510) 681-5652. Cheers to Joan Gelfand, all poets, National Poetry Month, our Environment, and our souls! learn how by Climbing the Sacred Ladder! Shulamit Sofia MSW, social entrepreneur, college professor, artist and writer is dedicated to support you to have more Love, Joy, Peace and Purpose in your life. After establishing a program to help over 250,000 children in orphanages and war zones find more safety and security, she founded Soul Strength Seminars to teach the same principles to people wanting to reach their soul goals. Cheers to Everyone, National Poetry Month, our Environment, and our souls! Kim McMillon’s “Writers On Writing” event energizes, inspires, delights panelists and audience! Coach Teresa LeYung-Ryan will define “writer’s platform” and guide audience in an exercise to identify their fans, brands, and write their platform-statements (for authors of fiction and nonfiction, before and after publication ). What else do Joan Gelfand, Yolande Barial and Teresa LeYung-Ryan have in common? They are proud members of Women’s National Book Association-San Francisco Chapter! Writers’ Platform-Building Coach Teresa LeYung-Ryan . . . energized from being with writers today at Rockridge Library, Oakland, CA. Writers' Platform-Building Coach Teresa LeYung-Ryan asks "What do fans do for you?" Click on the blue title bar of this post so that you see the full post and empty boxes. • when you’re satisfied with your composition, click the “submit comment” button. Voila! I will receive a notification that there’s a new comment waiting for me to moderate and publish. Dear Kim McMillon, thank you so much for having orchestrated the “Writers On Writing” panel. Thank you, Rockridge Branch Manager Pat Lichter & Reggie! Yours truly (Coach Teresa LeYung-Ryan) had sooo much fun with Kim and fellow-panelists Yolande Barial, Joan Gelfand, Judith Cody, Stephanie Dale (from Australia!). Seeing talented friends in the audience– Lori Overgaard Noack, Laurel Anne Hill, Sally, Rosie, D.C., Lakshmi Kerner, and all the brave writers in the room– made my heart sing! Award-winning Australian author and journalist Stephanie Dale (My Pilgrim's Heart) chats with artist Wanda Sabir at "Writers On Writing"
Writing Coach Teresa LeYung-Ryan with Cynthia Johnson-Colston (children's stories) at "Writers on Writing"
Writers who filled out my evaluation forms (thank you! ), I’ll be emailing you more writer’s platform-building coaching tips. Thank you, beloved Kim McMillon!